Barry has already been fishing for half an hour when we join him. He’s chosen a swim which, under usual conditions, would be sluggish and far from ideal – permanent peg 69 below Winthorpe Bridge . A day of incessant rain has brought the water level up by about 15cm , quickening the pace and putting a green tinge in the usually gin-clear water. The swim looks perfect! The Trent is regarded by many as Britain’s premier match venue. 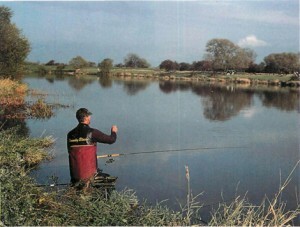 Unlike other waters, it seems to ‘produce’ its own anglers – those who find their technique perfectly in tune with the river’s mood. These anglers then dominate matches month after month, season after season, with almost monotonous regularity until a new name comes along. One such angler is Barry Allerton. But perhaps Barry has hung on to his reputation with more tenacity than most over the years. It is a changeable late October morning and dictable in their habits and respond consistently to the same tactics. So an angler who has perfected his technique can usually rely on them for a good weight. Nevertheless, since chub and big bream have started to show, it is getting harder to win matches with roach – you need more than a fair share of luck too. This makes Barry’s success all the more impressive. A lightly shotted stick float trotted through the swim is the classic way of taking Trent roach. Barry is something of a wizard when it comes to fishing a stick and this is the method that he’s chosen today. His choice is based on the conditions. A bit of colour in the water means the fish can be encouraged to come closer than they would if the river was low and clear — three or four rod lengths out, say. If they won’t move in then you have to fish farther out -maybe five or six rod lengths — and that’s when the waggler scores. For many anglers, the slightest downstream breeze is enough to put them off the stick and send them diving for a waggler. But unless the wind is a very strong down-streamer, it doesn’t worry Barry. He back-shots his stick and sinks the line so that it is unaffected by the wind. Barry reckons he’s already got between 2-3lb of small roach and bleak in the net, so he must have chosen well. His stick float design is unusual. The balsa body is broader than many sticks -more like a stream-lined Avon – but the tip is thin and extremely sensitive. An alloy wire stem makes the float stable and helps to keep it on course as it goes through the swim. Rather than bunching his shot, Barry prefers to string it at equal intervals – one every 15cm or so. His only reason for doing this is that it seems to work – and that’s good enough! Watching Barry putting a stick through, it is hard to see what sets him apart from other anglers – it looks so easy. He casts overarm about three or four rod lengths out – slightly downstream – and sinks and mends the line so it lies underwater, straight from the float to the rod end. Barry is right-handed, so when he feeds he transfers the rod to his left hand, leaving the other hand free to dip into the pouch of his bait apron. He throws in about 50 maggots 2-3m downstream and lets the float go through without taking his eyes off it – striking if it goes under or winding in and repeating the process if it doesn’t. The bait requirements are straightforward enough, too. For a typical match Barry takes along three pints of bronze maggots , half a pint of casters and about a pint of hemp. There is nothing mysterious here, so what is the secret to his success? There are few trees along the banks of this wide river – the reflected Nottinghamshire sky tends to make the water’s surface look white. The top of Barry’s black-topped stick creeps through the swim like a speck of soot. He’s had a bite nearly every cast so far and the speck looks as though it ought to vanish any second. It blinks and evaporates, leaving you wondering whether your eyes have deceived you, but Barry is in no doubt: the rod is up and the tip bending more than usual. The float emerges and shivers above the surface before plunging out of sight again. Soon a beautiful, silvery 10 oz roach is darting about under the water at Barry’s feet. This is a bonus roach for the stretch -most fish are in the bracket. In a match you need bonus roach if you are to break into double figures. ‘They are always there underneath the small fish. It is just a matter of who gets to the bait first,’ says Barry. It is clear that there’s more to putting a float through correctly than meets the eye. The beauty of a stick float is that you can do so much with it: run it through, slow it down, hold it back hard or hold it back every now and again. Today, Barry is running it through at the speed of the current. But how did he come to this decision? It all depends what the fish want. Barry thinks that there are a lot of small fish here. Apart from having caught quite a few, he is getting a lot of bites. ‘Less bites usually means less small fish. You may even get none at all to start with – but this is often a good sign and eventually the big roach will show,’ he says. He demonstrates his trick for catching bigger roach. Casting in, he lets the float settle and holds it back so the bait rises slightly. It is just at the point where he lets the float go and the bait starts to fall, that the float dives. Now, if there weren’t so many small fish present, this fish could have been a three-quarter pounder or even a pound roach. But today, holding back seems only to attract the attention of small fish – like the bleak which comes flying to Barry’s hand. By running the float through unhindered, he does at least pick up the occasional better fish. So it is all a matter of trying different ways of presenting the bait until you find out just what the fish want. ‘That’s strange,’ says Barry as he winds in after not getting a bite for the first time in a good while, ‘the maggot’s probably come off.’ Relieved to see he was right, he rebaits and casts down the swim just above the shoal – this saves time. The float travels a metre or so before the black speck blinks again and there follows the satisfying ‘clonk’ as Barry strikes into another good roach – at last, they’re here! ‘That’s why you need to use a lightly shotted float, dotted right down – those roach have already had the bait in their mouths for about ten seconds before you see the bite,’ says Barry. There follows a succession of roach ranging from 6-10oz , punctuated by only the occasional small roach, bleak or gud- geon. Then things go quiet again. Barry’s been feeding a few casters as well as the maggots and now he is going to try one on the hook. In a match it would be fatal to change baits halfway through, but there’s nothing wrong with experimenting when pleasure fishing. He waits longer than usual for a bite. When the float finally goes it turns out to be a 6oz silver bream that has grabbed the bait. ‘That’s what you get at Long Higgin. You need about 15lb of them to get in the money,’ says Barry. Back on the maggot again and he’s really getting into his stride. ‘This one doesn’t look like a roach. It’s pulling too hard,’ says Barry. But he’s wrong – it is a roach, a 14oz prime condition fish. By the end of the session Barry is well into double figures. By varying the line on which he runs his float down he has managed to stay in touch with the roach. He admits that when it comes to tackle and bait, things are really quite simple. The secret lies in finding out how the roach want the bait presented, and in perfect float control.